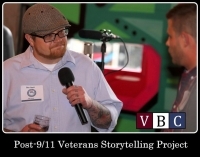 The Veterans Breakfast Club has appointed Nick Grimes as Director of its new Post 9/11 Veterans Storytelling Project. In April 2016, VBC launches a special effort to reach younger veterans who do not regularly attend weekday storytelling breakfast events. The goal of this special project, generously supported by the Jefferson Regional Foundation, is to provide those who served since September 11th 2001 opportunities to tell their stories—in their own words. The Veterans Breakfast Club encourages post 9/11 veterans to tell their stories so that families, friends, and neighbors can be educated and inspired by them. Mr. Grimes, who currently resides with his family in Oakmont, Pennsylvania, served from 2004- 2011 with the US Army’s 101st Airborne and 10th Mountain Divisions. He spent a total of 27 months in combat in Afghanistan. From 2011-2015 he served as the director of the Hazelwood Meals On Wheels program and Nick joined Leadership Pittsburgh Inc. as its operations coordinator. Nick is also a graduate of Leadership Pittsburgh’s prestigious Community Leadership Course for Veterans. The Veterans Breakfast Club is a local nonprofit organization whose mission is to create communities of listening around veterans and their stories. The organization does this through public storytelling programs where veterans of all eras can share their memories and build camaraderie. Each year the Veterans Breakfast Club holds more than thirty breakfast events at nine different locations throughout Western Pennsylvania. Visit The Veterans Breakfast Club Website.